Old and New Towns of Edinburgh comprise the medieval Old City with its castle, and the planned extension of the New City. In the Old Town, the Edinburgh Castle became the seat of Scottish kings, and many struggle took place here. With the Treaty of Union in 1707, Scotland lost its sovereignity and the Castle its royal function. The Old Town is also dominated by the Holyrood Abbey and the Palace of Holyroodhouse. In contrast with the medieval old city, a neoclassic New City has been developed in the 18th century to house Edinburgh's growing population. This part of town is the largest area of Georgian architecture in Europe. Notable public buildings here include the Register House, the Royal Scottish Academy and the Assembly Rooms. So if the Skyline is what makes it different, Edinburgh should particularly be enjoyed from a high viewpoint. 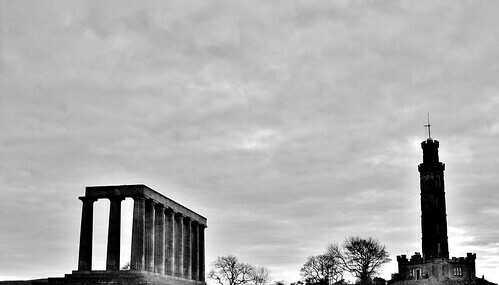 On a crisp Sunday morning in December I walked the short and easy trail to the top of Calton Hill. This is a setting very typical of Edinburgh: it’s one of several hills surrounding the city center, dotted with monuments and memorials to historic Scotsmen. I wasn’t the only one enjoying the morning here: especially young Asian tourists (or are they students?) know about the place too. This spot allows unobstructed views on both the Old and New Towns. You supposedly can see as far as the Forth Bridge, although I wasn’t able to spot its red arches. There’s plenty to discover: landmarks such as the Castle and the Hotel Balmoral of course. But also the numerous thin, (neo)gothic spires that stand out like needles piercing the sky. The obelisk of the Political Martyrs' Monument and the Scott Monument are two eye-catching examples of these. The Edinburgh City Council tries to protect the “key views and skylines that are considered fundamental to the image and sense of Edinburgh”. Not an easy task in a prospering city and noting the “international revival in the fashion for high buildings”. A controversial plan seems just have been thwarted to create dramatic “Inca-style” terraces on either side of Calton Hill. This in addition to the commotion a proposed 12-storey luxury ‘ribbon’ hotel stirred earlier this year. Edinburgh also has more than its fair share of notable single buildings. On my first visit to this city in 2001 I covered Edinburgh Castle, Holyrood House and other tourist hotspots along the Royal Mile in the Old Town. This time around I started with St. Giles Cathedral. It’s a rather bright structure as far as cathedrals go (it’s actually a former cathedral, having only acted as such from 1633- 1638 and again from 1661-1689). You’ll be looking in vain for the High Altar in its usual position: the church now being owned by the (Presbyterian) Church of Scotland, the focus of worship has been moved to a sanctuary in the middle of the church. The interior further distinguishes itself by the many stained glass windows. The ornate Thistle Chapel unfortunately was closed for the day. Next stop in the Old Town for me was the National Museum of Scotland. This refurbished museum comprises two connected buildings, one of those being dedicated solely to Scottish history. It’s a great building for a museum, very light and airy. Entrance is free. Just as I remember from my first visit in 2001, I wanted to like it but had trouble doing so. It’s more of a collection of rarities than a consistent story. I went looking for displays on the Forth Bridge (the “icon of Scotland” nonetheless), but there seem to be none. The museum does have two left-over railwaytracks of its predecessor, the unfortunate Tay Rail Bridge. 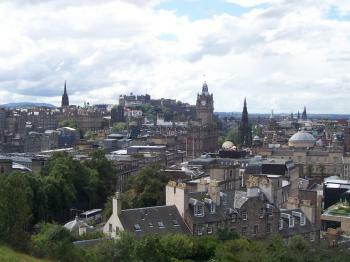 The UK started its Justification for Inscription in 1994 with the sentence “Edinburgh is a great city”. And indeed, it seems to be both one of the prettiest and most livable cities of the country. I would happily go there again and explore some of the minor sights. Many thanks this time go out to Freda & Iain Jackson for inviting me to stay, allowing a glimpse into what life is like in Edinburgh and showing the subtle impact WH travel has on their existence (such as daily use of an eclectic collection of German WHS tea mugs). The first discarded leaves of autumn crunched underfoot where they lay scattered amongst the graves of Greyfriars Kirkyard. They served as a thematic link to the tombstones – proper 18th century grave-markers carved with macabre skeletal figures and empty-eyed skulls. Why dress things up? The seasons turn and we age. Change is inevitable. Death is inevitable. The new replaces the old. And nowhere is that truer than in Edinburgh, where the filth and jumble of what we know as the ‘Old Town’ was abandoned for the sterility and order of the New Town across the Nor Loch. These two aspects of Edinburgh were jointly and justifiably inscribed as a single World Heritage Site. This was a fitting tribute to Auld Reekie’s split personality, a city where Deacon Brodie could serve as a respected councillor by day and rob by night, where the professors of medicine could procure fresh corpses for their anatomy classes from body-snatchers, and which influenced native son Robert Louis Stevenson to pen The Strange Case of Dr Jekyll and Mr Hyde. This was probably my tenth visit to Edinburgh, though my first as a pure sight-seer. Previous visits had been for weddings or stag dos, to see friends, to watch or to perform at August’s Fringe Festival or for work. As my wife pointed out, “The rules are different when you’re a tourist. Even more so when you have a child.” And so on this trip we did all the touristy stuff: visiting the castle, shopping for Harris tweed, stopping to watch the bag-piping buskers. But what shocked me when I consulted a map of the actual boundaries of the inscribed area was this: to me, Edinburgh is the Old Town but to UNESCO the Old Town is maybe only a third of what makes the city special. The New Town spreads out and over the ridge of Princes Street for a considerable distance north; it also spills west out beyond Haymarket Station. A fascinating comparative investigation of the Old Town’s Gladstone's Land (a 17th century merchant’s tenement on the Royal Mile) and the New Town’s classical Robert Adam-designed Georgian House (both owned by National Trust Scotland) will have to wait for another day. Our New Town trip started and ended with a bus stop on Princes Street. The remainder of the day was spent in the Old Town: up the steep cobbled slope of Ramsay Lane (a challenge with a push-chair! ), an explore of Edinburgh Castle (including the Romanesque 12th century St Margaret’s chapel, the oldest building in Edinburgh), and then a wander down the full length of the Royal Mile (with a side-trip up George IV Bridge to Greyfrairs) to the gates of Holyrood Palace. Edinburgh Castle is expensive – thankfully we got in for free with my wife’s Historic Scotland membership because otherwise turning up without pre-booking would have cost us £37! Prices are cheaper is you pre-book an entry slot. One piece of newness since my last visit is that the Tron Kirk on the Royal Mile now houses an exhibition from Edinburgh World Heritage. It features the views of locals on what World Heritage status means to them (not always complimentary – one young woman is featured stating that the city is full of statues of long-dead men who mean nothing to her), information about other World Heritage Sites in Scotland, and a bric-a-brac store. And so back to Greyfriars Kirkyard. If anywhere should stand as a representation of the split personality of Edinburgh’s World Heritage Site I would argue this is it. It has the history of Edinburgh running right through it – quite literally, as a section of the Flodden Wall, thrown up to defend the city from a feared English invasion, bisects the kirkyard. Presbyterian Scots signed their National Covenant against monarchical and ‘Papist’ interference in the kirkyard in 1638. Some 40 years later the defeated remnants of the Covenanter forces were imprisoned here in an open-air camp. The notables buried here run the gamut of the great and good of Scotland from the 16th to the 19th centuries. Mortsafes, cast iron cages designed to protect graves from body-snatchers, can still be found in situ. As a nice link to the New Town, its chief architect James Craig is one of them. And of course there is the nice story-book gloss of the tale of Greyfriars Bobby, the faithful Skye terrier who guarded his master’s grave for 14 years, a tale that found favour with the Victorians who were always keen to sentimentally project human emotions on to domestic animals in a way they never seemed to do with, say, the actual humans living beneath the yoke of their far-flung empire. Despite being a Brit this was my first time visiting Scotland when I travelled with friends in December 2016. After checking in to our accommodation in the heart of Old Town we first visited the cathedral, named after St Giles. It is smaller than I expected from such an important city, but that probably stems from the fact it was built in an area that was already bustling, in the heart of Auld Reekie (as it was nicknamed for its smell). We stopped off beside a statue of Adam Smith, the father of modern economics and a face you can see on the £20 note (although ironically not on the Scottish version). Highlights of my time in Edinburgh included a whisky museum, hiking up for the view from Arthur's Seat and enjoying some of the historic pubs in Edinburgh's New Town. As magnificent as it is, Edinburgh had escaped from my itineraries for a while, perhaps due to its a bit out-of-the-way location; this was only my 3rd visit to Edinburgh. It's always such a pleasure to stroll here. One thing to note about the Edinburgh WHS is that the New Town is already 3 centuries old and is noted for the Neoclassical architecture. The New Town also has a lot of explore. 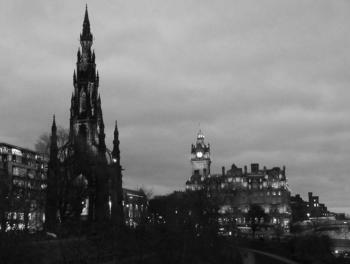 Edinburgh is a special city: grey, Gothic, and Georgian, yet still warm and welcoming. Past meets present in both the Old and New Town. This is no more visible than the two ends of the Old Town's Royal Mile, where visitors can start their day at the imposing Edinburgh Castle, then walk downhill past churches, kiltmakers, and cafes before reaching the very modern Scottish Parliament building. The heights of the Old Town with its winding streets and layered alleys tower above the orderly New Town with its parks and townhouses. Edinburgh is a city of education, with a famous medical school, and a city of literature, with a writer's museum and a monument dedicated solely to Sir Walter Scott. I've been to Edinburgh twice now, most recently last October, and it was as amazing to visit the second time as the first. I can't think of anything more to say that hasn't already been said in other reviews. By all means, if you haven't been, Edinburgh is well worth a visit. Logistics: Edinburgh is extremely walkable, although there are busses and trams throughout. I highly recommend climbing to the top of Calton Hill or Arthur's Seat for tremendous views of the city. The Old Town is one of the most beautiful areas in one of the most interesting cities in Europe. From Edinburgh Castle, the Royal Mile leads to the Holyrood Palace and the Scottish Parliament. This is definitely the most touristy part of the Scottish capital which embodies history, history, history... Many attractions, souvenir shops and Kilt Makers make the city of Edinburgh everything you would expect. In the side streets you will find many quaint pubs, night clubs, restaurants and cafes. Even the best museums in the city can be found in the immediate vicinity. The Back Alley opens to a breathtaking view of the opposite New Town. I've had the great pleasure of spending 6 months in Scotland as a student. During this amazing opportunity I spent countless days exploring every corner and side street of Edinburgh. From Calton Hill, the Scott Monument, the Royal Mile, Hollyrood House, Greyfriar's Church, Edinburgh Castle, the museum and galleries in New Town, the new and old Scottish Parliament, and Arthur's Seat. I even made the long (but enjoyable) urban trek from central Edinburgh to Leith Harbour. The museums are excellent. The National Museum of Scotland, Scottish Portrait Gallery, Scottish National Gallery, Scottish National Gallery of Modern Art, and the Writer's Museum are all worth visiting, if you have the time. One perk of Edinburgh is that the sites are often free or inexpensive! Exception is the overpriced Edinburgh Castle. Edinburgh is an exceptional world heritage city, and one of the most enjoyable cities to exlpore on foot or public transportation. I think the map of the inscribed property could even be expanded to include other historic areas of the city. This is however unlikely to happen because of developmental concerns. To my mind this is Britain’s finest World Heritage Site, both in terms of what there is to see and also the visiting experience. I knew that Edinburgh was a rather hilly city, but I was still surprised by just how craggy it was. The castle sits atop an extraordinarily high outcrop, especially when viewed from the bottom of Princes Street Gardens, which sit in the ravine that divides the old and new towns. 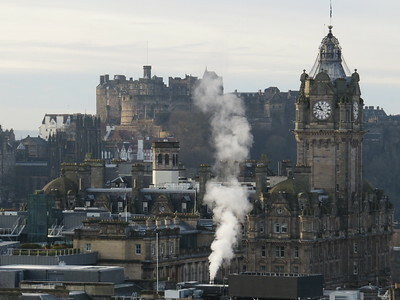 To my surprise Edinburgh also manages to contain a ‘mountain’ in the heart of the city, with the looming presence of Salisbury Crags and Arthurs Seat providing the backdrop for the new Parliament Building and Holyrood Palace. The World heritage inscription makes a point of this being the Old and New towns of Edinburgh and there is a very big difference between them. The Old town feels very medieval, focused around the touristy Royal Mile. I enjoyed strolling along here, but had more fun ducking off down the side alleys to clamber up and down streets of stairs or fine lovely secluded parks like Dunbar Gardens. The well planned New town reminded me of Dublin and Bath, and I really enjoyed strolling around here and heading down to the Stockbridge area for a leisurely brunch on Saturday morning. The differences between the Old and New towns were a large inspiration on Jekyll and Hyde, written by Edinburgh native Robert Louis Stevenson. This is just one of the points that illustrates Edinburgh’s huge literary heritage. It ranges from the works of Sir Walter Scott through to the modern detective fiction of Ian Rankin or as the inspiration for Harry Potter novels. This was the reason it was made UNESCO’s first city of literature. Edinburgh also had a large impact on Political, Economic and Scientific thought which led to it being termed the ‘Athens of the North’. This also explains the national monument in the shape of the Parthenon which is situated on Carlton Hill and offers magnificent views. I visited during the famous festival in August, and I really loved the buzz that came with being in the centre of the world’s largest arts festival. I really loved the city, and for the first time visiting a WHS city in Britain I really got the frisson I get from visiting unique foreign destinations. It offered so much to do that I would have no problem heading back up for a repeat visit, there is so much more I could write but I don’t want to bore people. Britain’s best world heritage site! Edinburgh remains one of my most favorite cities. I love the history and the modern city as well. The Castle has magnificent views and is magnificent itself from the Honors of Scotland to the War Memorial to St. Margaret's Chapel. Holyrood at the other end of the Royal Mile has it's own attractions with a fascinating hall of portraits to the tower where Mary Queen of Scot's secretary was killed. But then there is the Grassmarket as someone else has mentioned and the fantastic Museum of Scotland. You can go to Sandy's Bells and hear music that has been sounding through Scotland for centuries. An then there is New Town and the Georgian House and Thistle and Rose Lanes and food and drink. And then you can take the long walk to Leith and think again about Mary Queen of Scots and her first ride up to Edinburgh from the port. What a wonderful place. Well... what can I say? Edinburgh just sweeps me out of my feet! New Town is exquisite, elegant and charming, but Old Town is my absolute favourite. I went there on an "exploration" trip because I'm going to live there for at least a year, and as I live in an island(also gorgeous to death - Sao Miguel in the Azores), I had to know how far from the sea I would be... Well, the first thing I herd as I woke up were seagulls..I felt right at home! Edinburgh has the best part of a world capital along with a cosy feeling of a small town. You cn't help but to feel at home! Much of the architectural style in Edinbugh is consistent which gives a sense of order and identity. Edinburgh is also situated against the North Sea, which provides a sense of openness. The one thing that amazed me when I was there was how the weather varies literally from street to street. You can be walking on one side of the street where the clouds obstruct the sun and it maybe raining and on the opposite side of the street it will be sunny. Wonderful city. OK, so I did not try the haggis (there have to be limits), but I still enjoyed Edinburgh a lot (maybe because I skipped the haggis?..). The new town from the 17th and 18th centuries is well preserved, but was less interesting to me; the medieval old town, however, is wonderful and a great place to stroll. The castle, especially, is a great place to explore and really a treasure trove of Scottish history. If you get the chance, go see a performance of the Military Tattoo, held every August in front of the castle entrance. Really a great experience, and the bagpipers are definitely great musicians, even if I had had my doubts about this before. Also worth a visit is the suburb of Leith, where the royal yacht Britannia lies at anchor and can be visited. Plus Edinburgh is a good place for visits to other parts of Scotland, after this great city has given you an introduction to this country's peculiar culture, history, and language (you get to used to it..). Everybody should visit Edinburgh at least once in their lives, and if possible go during the summer festival, the Fringe Festival, the Tattoo Festival... all worth seeing, great people and great views. I've visited Edinburgh several times, and it seems I can't get enough of it, its people are really welcoming and charming, and don't worry if you are on your own, get into a pub and most certainly you'll feel at home. Aye! I'd like to live in that wonderful city! Have you ever had the feeling, say walking in a city, that you have been there before, but in actuality you have never been there before? The city itself is one of the most beautiful cities I have ever seen, and I can't help getting "that" feeling walking the streets. Small cobblestone walkways that lead to closes, everywhere there is history. Every corner you turn,there is a story to be heard. If you have even a small imagination, you can picture what it was like here in the middle ages. The people are super friendly, the food is wonderful. (yes, and even try the haggis) The grassmarket area is my favourite, where there are a few small pubs and lots of great restaurants. And check out my friends band The Roods who usually play at Finnegan's wake every week for some great celtic rock. For a party BETTER than Mardi Gras, try Hogmanay or Festival. I have been to both, and wish to be nowhere else on New years eve but here. There is no city in the world, where i would give up my citizenship, to be. As I wipe a tear from my eye! 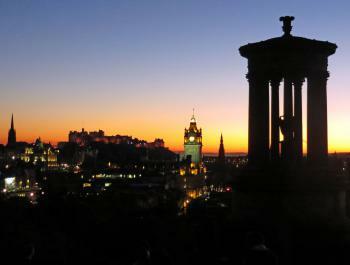 London is great, Paris is greater, but Edinburgh is out of this world! 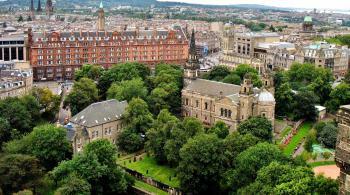 The old city of Edinburgh is a world heritage site by itself. The attractions include the Castle on the hill overlooking Princes Street (Oxford Street of the Scottish Capital), Palace of Holyroodhouse, The Royal Mile in between, Arthur's Seat (an extinct volcano) in Holyrood Park, St Giles Cathedral (small for a cathedral but containing the chapel of the Knights of the Ancient and Most Noble Order of the Thistle), The Firth of Forth, the University, St. Mary's catholic cathedral, numerous other old churches, the street where Sean Connery was born and was a milkman(he doesn't live there any more). I was there during the Festival in August, which is the largest Art event in the world. The city swells up in population as people from all over the world come to join in the festivities. You will never be bored because of the thrilling sounds of the bagpipes wafting over the hills. Don't miss the Military Tattoo if you can help it. They call it the "Greatest Show in the World", P.T. Barnum notwithstanding. The well-travelled Irish flautist James Galway once said that this city is his favourite city in the world. Edinburgh has an international airport, with frequent flights within Europe and even to the USA. A bus line and a tram line connect the airport with the Old and New Towns. Equestrian Statues: Duke Of Wellington (1852) "The horse is Copenhagen, a favourite of the Duke's - a superb battle horse that was unflinched by gunfire. He was ridden by the Duke throughout the whole Battle of Waterloo. Later he was retired to the Duke's estate of Stratfield Saye where he died aged 29 in 1836 and was buried with full military honours." Also background to the politics of the statue in the link. Edinburgh also has an equestrian memorial to the Royal Scots Greys Regiment (1906) in West Princes St Gardens. It commemorates the regiment's service in the Boer War. Cultural sites damaged by fire since inscription: Old town of Edinbugh had a major fire in Dec 2002. Thomas Telford: Dean Bridge is within the inscribed area of the "New Town". Designed by him in 1833. 4 arch 106ft above the Water of Leith. Isabella Bird: Visited 1869. Describes the slums of the "Old Town" in "Notes on Old Edinburgh"
Queens and Empresses: Mary I of Scotland gave birth to her son James in the Royal Palace within Edinburgh Castle. Built in the 18th century: New Town - The New Town was an 18th century solution to the problem of an increasingly crowded Old Town. In 1766 a competition to design the New Town was held. 538 Community Members have visited.